Let Hawkeye Volume Lead the Way. There is no better tool to trade with than Volume, and Hawkeye Volume is the Best! Volume leads the way to price direction. I’m glad you asked. . .
Volume is the only leading indicator that signals when price is about to move prior to it happening. You see, Volume is the fuel that drives the market. 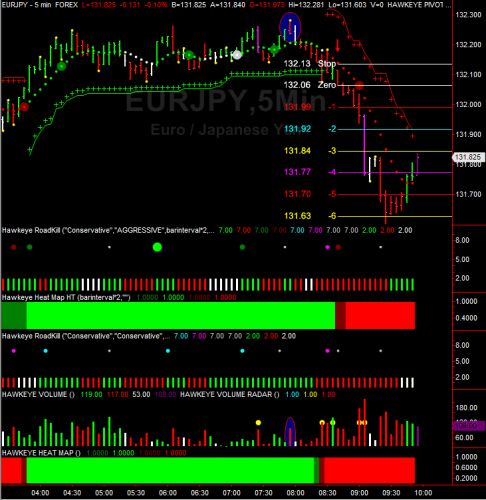 And when you couple this with triple timeframes, you have a combination that gives traders all over the world the edge. Hawkeye Volume displays whether buying or selling volume is dominating the market. In other words, it doesn’t just tell you the volume, as with other trading software, but it actually tells you whether the volume is professional BUYING or professional SELLING. This is displayed in a simple and visual way: red shows professional selling, green shows professional buying, white shows no demand. Notice how just before the big price move down, that Volume signaled the intent of price 9 price bars (45 minutes) before the trend began. It is shown by the Red price bar extension with a Hawkeye Pivot (yellow dot). This is significant in that we expect price to reverse 3-5 price bars after a Pivot. However, with opposing volume too, it becomes a compelling signal of market reversal. In this example, it was quite rewarding. 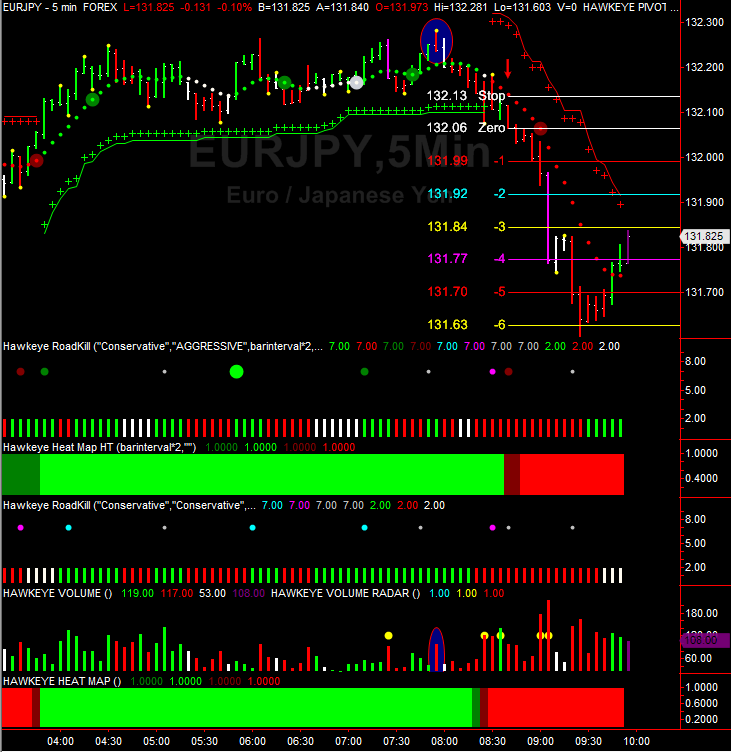 As you can see, using the Hawkeye ATR Levels tool, we achieved a 6:1 Reward:Risk. Setups like this occur every day, and Hawkeye Volume is the best at showing you this action. Don’t sit on the sideline and let trades like this pass you by. . . Hawkeye Volume leads the way and is the core component of all our unique indicators. Next PostNext Which Mouse Are You?